Ooo, goody! I love new-book-release Tuesday. 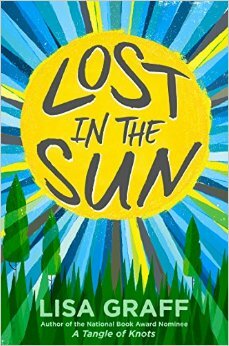 Today we celebrate the release of an awesome new book by Lisa Graff, Lost In the Sun. Young readers, get ready to get your socks knocked off. For real. This book has lots of drama, action and plain old-fashioned good writing. It follows tTrent during his first year of middle school. Poor Trent can’t even think about all the social landmines that come with being in sixth grade, however, because he’s still grappling with a horrible accident that happened in fifth grade. During a normal game of after school hockey, Trent slaps a puck into a kid who later dies. Trent is haunted by the accident and struggles to cope with the warring emotions battling inside him. He is angry, sad and confused. It’s a great book to help you understand what it feels like to lose someone and what it means to feel responsible for something awful. A really good read.